IT SHOULDN'T happen. It is a petty form of protest and the very thought is enough to turn a stomach. 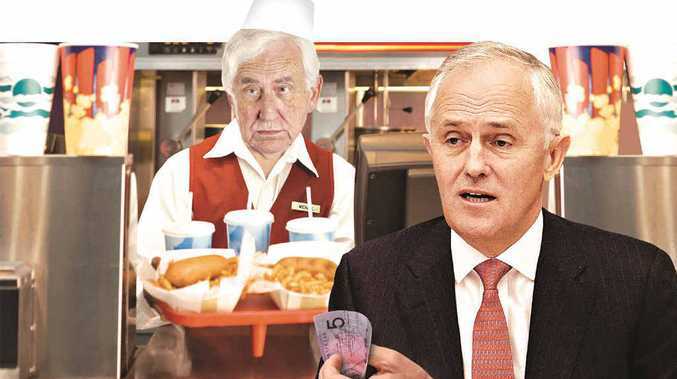 Still, I would be thoroughly checking beneath my burger patty if I were Malcolm Turnbull. I worked in a busy kitchen for a while and never witnessed anyone lodge foreign matter, of human origin or otherwise, in an unwelcome customer's meal. But you do hear stories. If the Prime Minister continues down the path of slashing penalty rates, I hope his personal chef gets a fair wage. The Productivity Commission has called for Sunday rates for hospitality and retail workers to be cut to the same level as Saturdays. Public holiday pay would also be cut from 2.5 times to the 1.5 times rate workers currently get for Sunday shifts. The assumption is it would create 39,000 new jobs and 60,000 extra work hours a year. In my experience, it is a flawed theory that will end up with lowly kitchen hands like my former self developing scurvy from an impoverished diet of two-minute noodles and dreams of better days. High school kids, young adults and mums and dads will be slaving away for less under the assumption their weekends are less valuable than those of people in skilled industries. You might note there is no proposal for cutting penalty rates outside the sectors that are already among the lowest paid. The whole idea of penalty rates is to allow low income workers to receive better pay if they are willing to go the extra mile and sacrifice spending weekends with their families. The notion that business owners will spend the extra money they are saving on hiring more workers is a lovely, but far too optimistic, notion. Some will decide they can make more money with extra hands on deck, but I would say most will keep the savings as profit - and many of their businesses are already highly profitable. The cost of a quarter chicken and chips will remain the same and the money workers are not being paid will be taken out of the day-to-day economy. If the level of incessant spruiking of how the government is cutting red tape for small business owners was congruent with the results, every cafe owner would be a billionaire by now. Tony Abbott was afraid to touch penalty rates, but his successor now says changes are under consideration. It is an Ebenezer Scrooge mentality that will hurt the poorest workers in Australia. Consider this: one in five privately-owned Australian companies with revenues of more than $100 million did not pay any tax last year. Zip. Zilch. Not a cent. And Turnbull wants to make private companies exempt from publicly disclosing how much tax they pay, all because a lobby group argued the exposure could cause business owners to be kidnapped and held for ransom when people discovered how rich they were. Looking for a way to help out small business owners who do the right thing? Make these fat cats pay their fair share instead of cutting back kitchen hands' wages. Then you can enjoy your double bacon cheeseburger next Sunday in the soothing knowledge that some wretched cook has not added any extra ingredients.